About a week ago, I woke up in the middle of the night and had an epiphany. 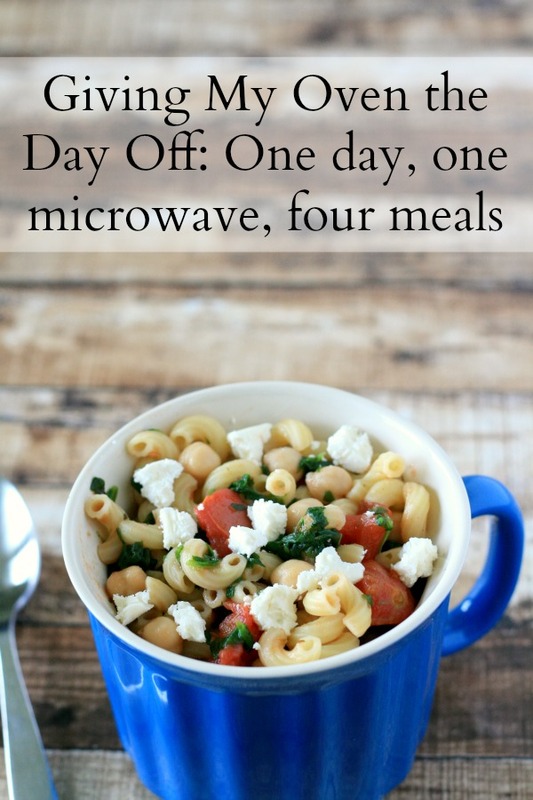 For one entire day, I was going to cook all of our family’s meals in the microwave. Breakfast, lunch, dinner AND dessert. Yes, these are the things I wake up in the middle of the night thinking about. Please don’t judge me. No. I was NOT going to prepare frozen microwaved meals. I was going to use the microwave to prepare REAL food and REAL meals. So, why use the microwave? One of the main benefits of microwave cooking is that it’s energy efficient. Small appliances like slow cookers and microwaves use less electricity than the oven (and don’t make your kitchen unbearably hot in the summer months). 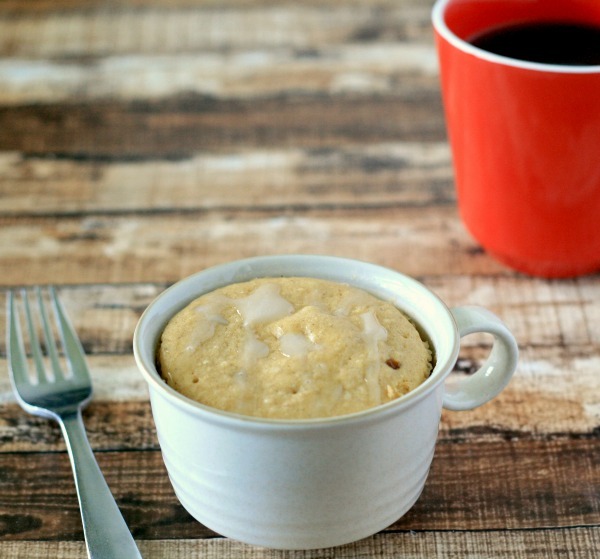 Microwave cooking also means less cleanup, which means you’ll be using less hot water. Bottom line: saving energy really can be quick and easy, and you can do it without sacrificing the quality of your family’s meals. Below is how my one-day microwaved meals experiment turned out. And, by the way, each of the recipes for these meals can be found in the “250 Best Meals in a Mug” book that’s part of the prize pack I’m giving away with this blog entry! I’ve tried “baking” in the microwave in the past and it didn’t work out well, so I was nervous about this one. I didn’t need to be nervous, though, because it worked great. The best part: I was able to “bake” a very tasty cinnamon roll in less than 10 minutes from start to finish. It’s a microwave miracle! Simply mix 1 tbsp melted butter with 2 tbsp beaten egg, 1 tbsp milk, 1/4 tsp vanilla extract. Stir in 1/3 c all purpose flour, 2 1/2 tbsp brown sugar, 3/4 tsp cinnamon, 1/4 tsp baking powder 1/8 tsp salt. Mix until smooth. Microwave in a mug on high for 60 to 90 seconds until puffed and center is set. For the icing, mix 3 tsbp confectioners sugar and 3/4 tsp milk until smooth. 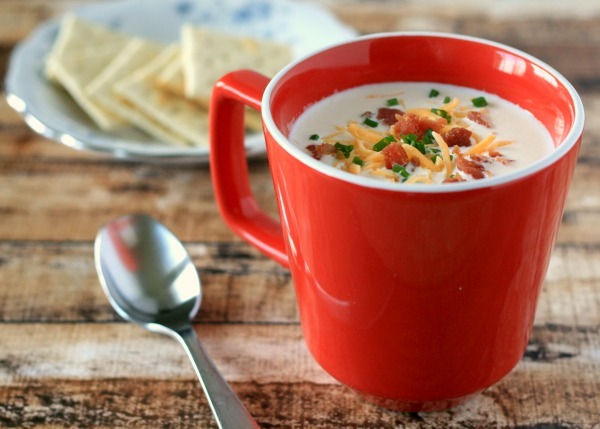 I love potato soup, and this soup — topped with cheese, bacon and chives — didn’t disappoint! Here’s a random tip: Keep the inside of your microwave (and oven) clean, because it improves their energy efficiency. In a mug microwave 1/2 c broth on high for 1 1/2 minutes until boiling. Using a fork whisk in 1/3 c potato flakes, 1/8 tsp garlic powder, and 1/2 c milk until smooth. Microwave on high for 30 to 60 seconds until hot. Let stand for 1 minute. Season to taste with salt and pepper. Top with 2 tbsp shredded cheddar cheese, 1 1/2 tbsp ready-to-eat real bacon bits and 1 tbsp chopped green onions. I’d never boiled pasta in the microwave before, until I made this meal. Turns out, it’s actually easier than making pasta on the stovetop! This pasta is meatless, but you can probably add some sausage to it to take it to the next level. In a mug microwave 1 c frozen chopped spinach on high for 1-2 minutes until thawed and warm. Drain excess liquid. Transfer to small plate. In the mug combine 1/2 c elbow macaroni or ditalini, 1/8 tsp salt and 2/3 c water. Microwave on high 2 minutes. Stir. Microwave on high for an additional 3 minutes until pasta is tender. Stir in spinach, 1/2 c canned diced tomatoes and 1/3 c chickpeas. Microwave on high for 60 to 90 seconds until heated through. 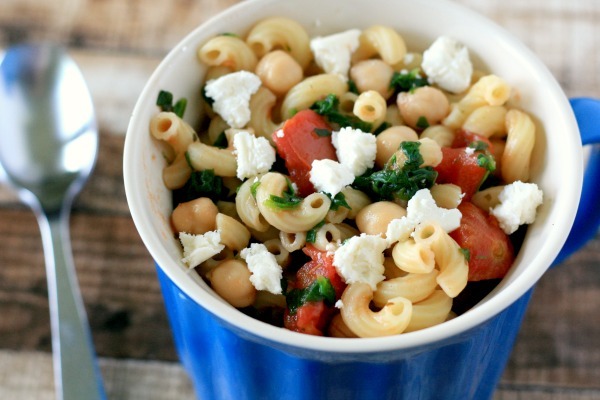 Let stand for 1 minute and top with 2 tbsp crumbled feta cheese. This dessert features Greek yogurt mixed with melted chocolate and served on a buttery cookie crust. Yep, pretty much every part of it was delicious. Here’s another random tip: If you’re making a small meal, use a small appliance (like a microwave or toaster oven) instead of a large one like your oven. In a mug microwave 1/4 c semi-sweet chocolate chips for 30 seconds. Stir. Microwave an additional 15 seconds. Stir until melted and smooth. 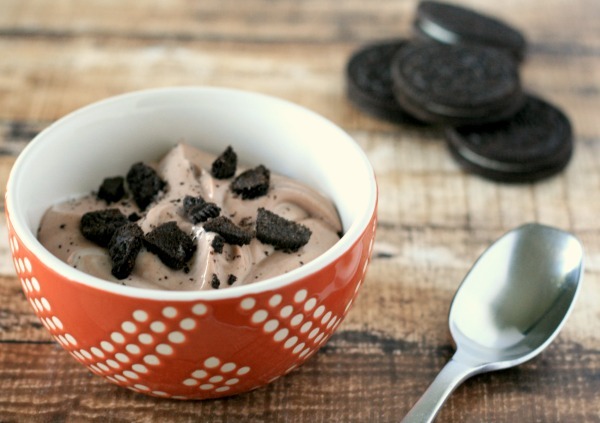 Stir chocolate into a 5-6 oz container of vanilla yogurt. Add 1 tbsp butter to mug. Microwave on high for 15-30 seconds, until melted. Stir in 2 crushed chocolate cream-filled cookies. Press cookie mixture into bottom of mug. Spoon yogurt mixture over cookie mixture. Refrigerate for at least 30 minutes. So there you have it. Breakfast, lunch, dinner and dessert, all cooked in a microwave and all super simple and super delicious. It goes without saying, but I’ll definitely be doing more microwave cooking in the future (especially during the hot summer months). For more microwavable and energy-saving recipes, visit PPL Electric Utilities’ Taste the Energy Savings blog or their Pinterest board. And now for that prize. The folks at PPL Electric Utilities have provided me with a prize package that includes a Project Envolve coffee mug, a Totally Bamboo 5-piece utensil set, and a “250 Best Meals in a Mug” cookbook. I’ll give it away to one commenter chosen at random (NOTE: You must be a PPL Electric Utilities customer). Feel free to comment with your own thoughts and experiences when it comes to microwave cooking! That microwave cinnamon roll looks absolutely amazing! Yum!